After seeing off my daughter and husband go to the nursery school, I enjoyed my moment of morning glory. Reading freshly printed newspaper. Then an article by critic and president of Genron Company (https://genron.co.jp/en), Mr. Hiroki HIGASHI strongly interested me, because he underlined that the SNS followers won’t be helpful in difficulties. 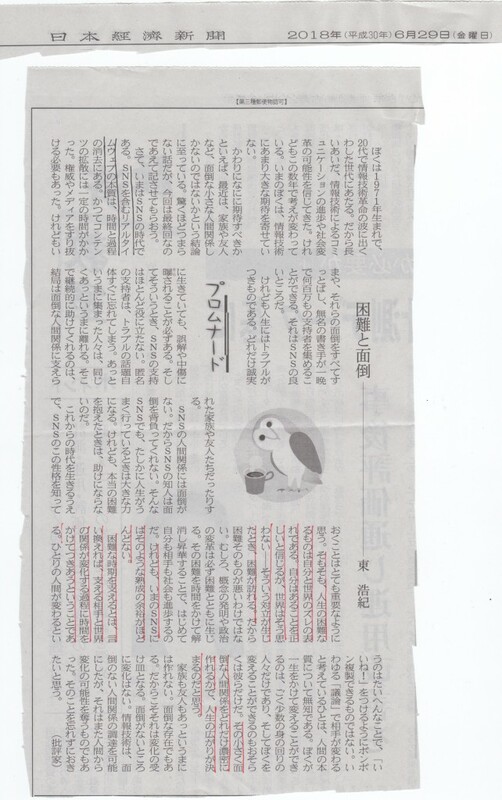 The critic continues that nowadays SNS has been highlighted but its aim is to erase the time and lengthly process. With reading his essay again and again, I do give my assent to his opinion. “ —— First of all, difficulties are often found in the gap between being oneself and belonging to external world. Yet, the SNS is still immature.” I am sometimes green with envy against those who don’t have child, because I always struggle being a mother and an artist at the same time. The writer concludes with simple words : The breadth of the life depends how create your personal and deep relationship with your relatives. It makes me realize that making artworks especially printed photography and parenting both needs unexpected time and lengthly process. The decisive moment is the conception of creative voyages.